This is a product review using a marinade called Jammin Jerk. We decided to used Jammin’ Jerk on a pork shoulder and came up with this delicious and spicy Jammin’ Jerk Pork Shoulder. Today’s Product Review; Nature’s Kitchen Nature’s Kitchen was founded by Rory Mitchell, with the help of his wife and son. They began their food journey when they started experimenting with herbs and spices as a means to begin living a healthier lifestyle. They also wanted to introduce the flavors of their cultures to their children. Rory is from Jamaica and his wife from India.With much love and encouragement from family and friends, along with many inquiries asking the couple, “What is on the meats and vegetables your preparing?” Lend to bottling their sauces in small batches, then taking the plunge to begin production in March of 2016. Nature’s Kitchen participated in the 2016 Flavors of Georgia and was presented the Food Product Contest Finalist Award for their Smokin’ Jerk BBQ Saucinade. Quite a feat considering they hadn’t any sauce bottled yet. All products are Georgia Grown. Sauces and Marinades are made with vegetarian ingredients, are Vegan and Paleo friendly and are gluten and corn syrup free. We simply fell in love with all of Nature’s Kitchen products. The flavors are fresh yet robust, smoky and spicy but not overpowering…The flavor was unlike any we had ever experienced before. If you want to experience a new taste sensation, then give Nature’s Kitchen products a try. I can certainly understand why Natures’s Kitchen won the Food Product Contest Finalist Award….I have a feeling that they will be winning many more awards in the future. Try Nature’s Kitchen, you’re gonna love them. We sampled four products from Nature’s Kitchen: Jammin’ Jerk Marinade, Robust BBQ All-Purpose Rub, Tangy Coffee Saucinade (sauce and marinade) and Rich Cocoa Rub. All of the recipes here are simple. We wanted to let the flavors of Nature’s Kitchen shine through, to experience the true flavors of the rubs, marinade and saucinade. All of the recipes can be cooked the anyway you like grilled, baked, roasted or slow cooked. 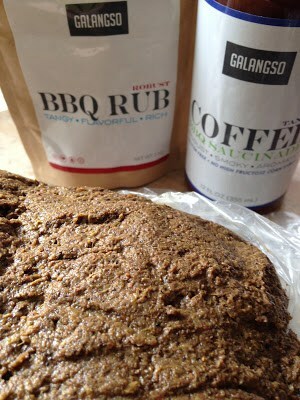 Cover pork roast completely with jerk marinade. 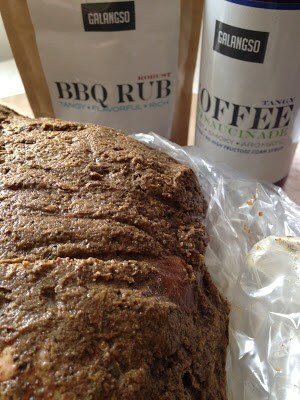 Place roast in a large plastic bag and seal. Place in the refrigerator 12 hours or up to 24 hours. 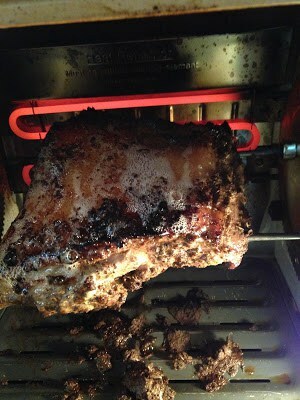 Place marinated pork shoulder roast on rotisserie. Roast on the rotisserie for 2 1/2 to 3 hours. Remove roast from rotisserie to a large serving platter. Cover with aluminium foil, let stand for 15 minutes.